Recently BluSky Innoventions™ the ‘Pseudo-Science, Holistic Wellness, Quantum Synergy & Bio-Weapons Division’ of Yumblog Holdings Plc was given an obscenely large EU grant to investigate whether it is necessary to cook pasta traditionally in a large volume of boiling water, or whether it could be prepared ‘risotto’ style in the merest covering of liquid. Our groundbreaking and highly controversial findings shocked the psuedo-science world, outraged the Daily Mail* and could change pasta-based cookery forever. This recipe was the outcome… read on. An artist’s impression of how exciting this recipe could be if you cooked it over a 10,000 Mega Joule thermal lance. 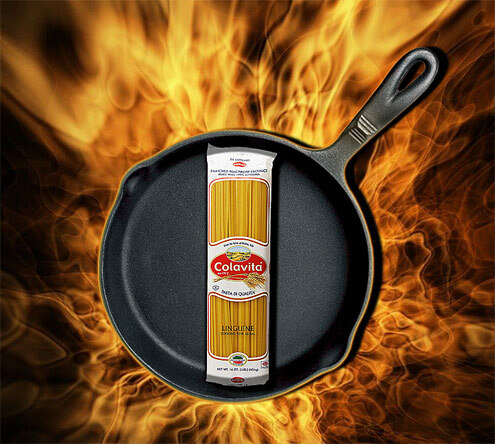 Find a skillet or frying pan large enough to accommodate your spaghetti (about 12″ in diameter). Pour some oil into this pan and add the garlic and chillies. Sauté until the garlic is golden. Next add the pasta to this pan and pour on enough cold water to cover along with a teaspoon of salt. Place over a high heat and cook uncovered for 8 – 10 minutes until the pasta is almost al dente. You’ll need to stir frequently to keep the pasta submerged and to stop it from sticking to itself. Pour most of the water into a bowl, so that there is only a little remaining in the bottom of the pan. Add the cooked garlic and chilli to the pasta along with the parsley and a generous amount of olive oil. Return to the heat and stir everything together – you may want to add a little of the starchy cooking water to make the sauce creamier. Adjust the seasoning and serve immediately with a salad. Verdict: Well I never, this just goes to show you don’t need a large pan of boiling water to cook pasta properly. This made a refreshingly clean and simple evening meal. Experiment and have fun. Drink: Our sommelier recommends and crisp, young and lively white. Entertainment: We are currently skipping through the insubstantial, disappointing and unintentionally funny 4th series of ‘Blakes Seven’. Avon & crew check out the latest ‘E-m@iler Plus Superphone‘ from Amstrad. * SHOCK PASTA REVELATION COULD LEAD TO A WAVE OF 2 MILLION GYPSY BENEFIT CLAIMANTS! Your pasta recipe is odd, and I’m sorry to say it left us uninspired in the face of your ‘insubstantial, disappointing and unintentially funny 4th series of ‘Blakes Seven’’ which we want to know more of. Specifically… where did you get a DVD copy of BS series 4? Is it on general release now? We got our B7.4 from LoveFilm, but it is also available from Amazon at a bargain bucket price of £15.49… which is probably what the series cost to make in the first place. Fret not, your comments are always welcome here at Yumblog Towers. Besides, we are made of tougher stuff thanks to years of fighting against the Federation and playing deadly games of cat and mouse with Servalan … etc.